Traditional PR tactics still apply in a digital world because they help companies gain online exposure and promote newly developed products, and earn backlinks. This is one of the oldest tricks in the book. Conferences or events such as launch parties, panel discussions, webcasts, or competitions give you a perfect opportunity to be covered in the news and gain online and offline exposure. Companies such as HootSuite for example often host events such as #hootup where they bring in industry experts to discuss about a specific topic, share advice, and more. During these events, attendees generally tweet or write Facebook statuses about the events which give HootSuite a major boost in brand exposure. • Establish credibility. If a reputable publication features you, you’ll automatically achieve a certain level of credibility. This shows readers that you have the necessary credentials in order to be featured in the publication and gives you the status of an industry leader. Interviews also let you demonstrate your expertise by giving you a stage for sharing insights. • Increase brand reach. After the interview is published, it’s usually shared on the publication’s social channels. This lets you gain exposure in front of the publication’s social media audience. • Drive traffic to your website. Publications usually include a link to your website in the bio section. This magical link will help you gain visitors and potential customers. Take customers, prospects, stakeholders, or students for a tour around your office to show them your work environment, talk about your business, and meet your team. Don’t forget your cool gadgets, artwork, and foosball table. Companies such as Vancity Buzz and HootSuite have teamed up with local organizations to tour students, young professionals, and publicists around their offices. These tours have helped attendees learn more about companies and industries and meet potential employers, while helping companies earn major online exposure through photos and articles attendees post on social media. Another great way to gain PR exposure is by offering exclusive insights to a few publicists or publications regarding new products or services, changes in your product direction or leadership team. Similar to how businesses compete for customers, publications compete for news and content. By offering exclusive insights to a select group of publicists or publications, you’re giving them the ‘scoop’; this in turn helps you build a strong, positive relationship with them. Over time this bond can increase the chances that they will give your new release coverage –even when it’s not an exclusive. An important note to remember is that ‘exclusive’ means you only provide a news item to one editor/publication in your select group. You can give the next exclusive to another publication. Perform research on your industry and share your stats about the industry. You can share the stats through the form of infographics, whitepapers, or blog posts. Leading marketing software vendors such as HootSuite and HubSpot (especially) establish themselves as thought leaders by publishing eBooks and whitepapers which cover the latest digital marketing trends or stats. These stats help HootSuite and HubSpot gain online exposure because other companies refer to these stats in their blog posts by linking to the eBook or whitepaper. Moreover, brands often share the eBook or whitepaper directly on their Twitter or Facebook page which further promotes companies who create the eBook or whitepaper. 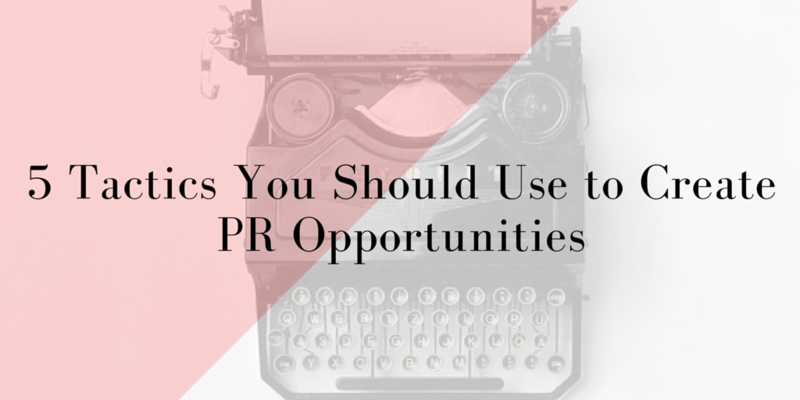 Traditional PR tactics remain an effective way in gaining brand exposure, creating excitement, and attracting clients. By using the five approaches above, you or your company can be featured in publications, social media channels, or blog content which will help increase your audience reach and chances of gaining new customers. PR is one of the digital marketing services Smartt offers as a part of its P.A.C.E. integrated digital marketing model. Smartt offers PR services such as press release creation. If you need help with digital marketing and PR or have any questions about our services, please contact us via this contact form.